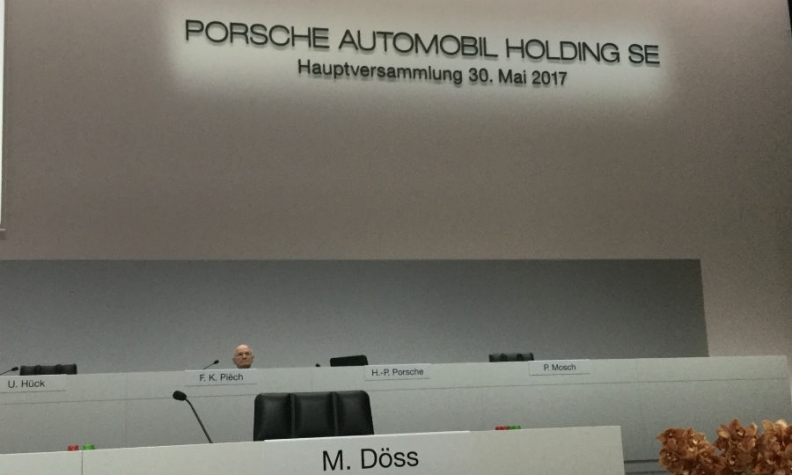 Piech sat down on the stage at Porsche SE's annual meeting ahead of other family members. Ferdinand Piech made what may be the last appearance at his family's holding company that controls a majority stake in Volkswagen Group. The industry patriarch, who turned 80 last month, attended Porsche Automobil Holding SE's annual meeting for the first time since he fell out with the rest of the Porsche-Piech clan, a dispute that led to his ouster as VW Group's chairman. Piech looked stoic as he took to the stage at the Porsche Arena in Stuttgart on Tuesday ahead of most of the other Porsche and Piech family members who sit on the holding company's supervisory board. The billionaire ignored the bright flashes of light coming from a small group of photographers beneath him. Standing nearby, his cousin and bitter rival, Wolfgang Porsche, prepared himself for the duty of chairing the annual meeting. The two have clashed on countless occasions over policy and strategy for VW Group. Piech's wife, Ursula, and their youngest son, Gregor, watched from the second row. Piech has not attended Porsche SE board meetings for two years after he clashed with the family over the future of former VW Group CEO Martin Winterkorn. Piech wanted him out but Winterkorn, backed by VW's key stakeholders including Wolfgang Porsche, became one of the few executives in VW's history to survive a Piech putsch attempt. Winterkorn later quit when VW's diesel-emissions cheating became public. Piech's motivation for attacking Winterkorn is still unknown. Some people close to the company felt it was an attempt to install his wife instead of Winterkorn as his successor as head of VW Group's supervisory board. A popular theory among industry watchers was that Piech, renowned for his pride in knowing everything that happened at VW, had gotten wind of the diesel-emissions fraud and confronted Winterkorn about it months before the scandal broke in September. Piech has remained silent, except to give a statement to German prosecutors leaked to the press saying he had informed VW's top directors about potential cheating on diesel-emission tests six months before the scandal became public. VW strongly denied Piech's claim, which led to the final rift between him, the Porsches and even the Piech side of the clan. Piech's re-election to Porsche SE's board was a foregone conclusion since the Porsche-Piech family had agreed to his candidacy in early April so his attendance at Tuesday's annual meeting puzzled observers. Company insiders expect he will resign his board seat in several months, relinquishing his place once the sale of his 14.7 percent voting stake in Porsche SE, worth roughly 1 billion euros, to his younger brother, Hans Michel Piech, is completed. The resignation will cut Piech's last ties with Porsche SE, and thus VW. It will open the door for younger Porsches and Piechs to take leading roles in the strategic direction of VW. Unlike Piech, who is regarded as ruthless and uncompromising, those members have shown themselves ready to work with each other.